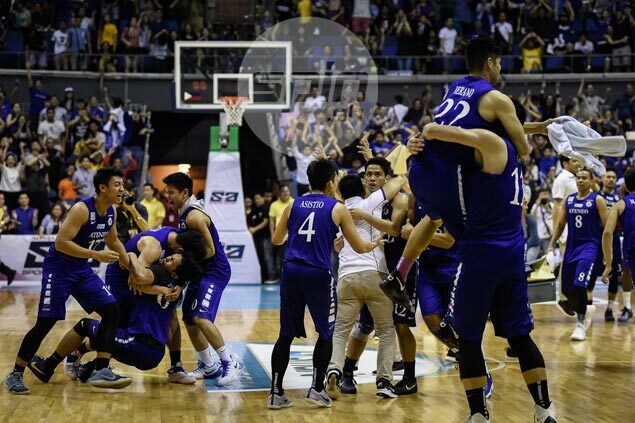 A BLOODIED Isaac Go scored the go-ahead basket in overtime as Ateneo outlasted Far Eastern University, 69-68, in overtime to reach the finals of the UAAP Season 79 seniors basketball tournament at the Smart-Araneta Coliseum. Go hit the only field goal for Ateneo in the extra period but it was enough to put the Blue Eagles in the finals opposite old rival La Salle as Ron Dennison's last-gasp shot on a fastbreak in a frantic, final-second sequence failed to beat the game clock. Go’s marginal basket came just a few minutes after a wayward elbow from FEU big man Prince Orizu during a rebounding play left the Ateneo player sprawled on the floor, blood flowing from his nose. "It was winning time, you have to stay on the floor. You have to play," Go, an underrated big man who earned a regular spot in head coach Tab Baldwin's rotation through the course of the season. Go finished with 12 points and 14 rebounds for the second-seeded Blue Eagles, who bravely held on in the endgame and put a sad end to the FEU coaching career of Nash Racela. Racela, who celebrated his birthday on Wednesday, will now go full-time as coach of TNT Katropa in the PBA. Game One of the first Ateneo-La Salle finals since 2008 will be played on Saturday afternoon at the Mall of Asia Arena. The Blue Eagles won that 2008 edition of college basketball's biggest rivalry, kicking off a run of five championships under Norman Black, whose son, Aaron, is now part of an Ateneo side that comes in as a heavy underdog against La Salle. Thirdy Ravena and Mike Nieto finished with 13 points each for twice-to-beat Ateneo, which was forced to play a rubber match after losing to third-seeded FEU last Saturday. Ateneo could've won the game outright in regulation but Dennison converted a running shot with 37.8 seconds to play in the fourth quarter to tie the game at 66 and Ravena's drive down the baseline at the buzzer refused to fall. Both teams bled for points in overtime as Vince Tolentino split two of his free throws stood as the only score until Dennison answered with a basket to give FEU a 68-67 lead. Go not only hit the marginal basket, but he also sprinted back on defense to distract Dennison, causing the FEU guard to fumble and miss beating the game clock by a split second. “Shot went down. I think you can’t separate these teams with a sledgehammer and crowbar. We were that close,” said Baldwin. “They made the last shot but it was half a second too late,” Baldwin added. Monbert Arong had 15 points, while Raymar Jose had 12 points and 12 rebounds in their final game as a Tamaraw as their reign as champions ended in heartbreaking fashion. Ateneo (69) — Ravena 13, Mi. Nieto 13, Go 12, Tolentino 9, Wong 8. Ma. Nieto 7, Asistio 3, Verano 2, Black 2, Ikeh 0. FEU (68) — Arong 15, Jose 12, Escoto 11, Dennison 8, Inigo 7, Comboy 5, Orizu 4, Trinidad 4, Nunag 2, Tuffin 0, Ebona 0, Holmqvist 0. Quarterscores: 15-20, 38-41, 53-49, 66-66, 69-68.